First, the Ottawa Senators will not come last place. Don’t get me wrong, the Sens will be a bad team this season. The preseason showed us that with the Sens only winning two games (one coming against a terrible Habs team and the other against an ECHL quality Chicago Blackhawks). However, if there is one thing we can take from the preseason is that the Sens looked very good at certain times. This good run of play usually only lasted a period or two in a game but there is some hope there. Because they are such a young team now, it will take some time to learn how to play consistent hockey. Still, I believe by the middle of the season, the Ottawa Senators will go on a little win streak. Bringing this back to my point of not coming last, I strongly believe the Sens will not come dead last as the Sens will be able to beat the Montreal’s and Buffalo’s of the league. And yes, I know, these teams are getting better, but at the same time Ottawa still has major scoring threats and if Anderson has a standout season, the Sens should pull through against not only the bad teams but some mediocre teams as well. Anderson and Condon will have good seasons respectively. I don’t know if people have noticed, but Anderson follows the tradition of playing well one season and the next season flopping. He has been doing it for a couple of years, and since last season was god awful, I am expecting a bounce back season from Anderson and expecting him to return to form. I also believe that Condon will have a bounce back season from last year’s 5-win season. This preseason he looked strong and focused on the task on hand and had a lot of spectacular saves. 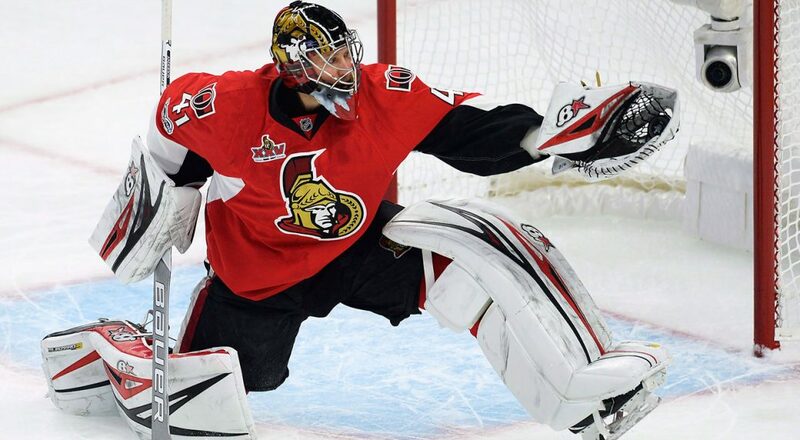 So, in general I am expecting a stronger goal tending tandem from the Sens this season, however, I still believe the Stats will be very weak due to the weak defence in front of the goalies. Now moving onto the players and starting on defence, I believe that Chabot will be our top defencemen. Chabot, I believe that he will have as much as a breakout season he can get playing for the Sens in his first full NHL season. I also believe Lajoie will have a strong season with around 10 goals and high 20s in points. Who knows maybe he will score in his first game. I will be looking for him to quarterback the Sens PP and hopefully make it more productive. As for our offence: Stone, Duchene and Tkachuk will be our top forwards. Tkachuk will have a crazy year and will prove to everyone that he is NHL ready. Formenton will finally learn how to capitalize on breakaways and you will see him getting a lot of SH goals. Zach Smith will return to form and be the great penalty killer and physical player we remember him as. As for Bobby Ryan, he will have a mediocre year but the good news is that he will remain healthy through most of the season and will only miss a week or two do to another hand injury. Thanks for reading! What do you think about my predictions? What are your predictions for this upcoming season? Who do you have winning the cup? Let us know down below on the comments or on our Twitter, Facebook, and Reddit. GO SENS GO! I think they’ll finish 27th overall. In basketball why doesn’t someone just hang from the rim and deny every shot? This is very well detailed and helpful, thankyou. I appreciate the way you cover key concepts succinctly. It’s useful info and I find you worth a follow.